Baby Zoe is a free app available for Android and Apple smartphones and tablets. Baby Zoe is designed to be a parent’s best friend to track the health and developmental progress of their children while also documenting the day to day joys of growing up. The husband and wife team of Rusten and Karen Gomez are putting their life experiences of raising two energetic, and often, wild boys to use to make sure Baby Zoe is a fun and rewarding tool that will help parents and doctors alike. Baby Zoe tracks your children’s eating, sleeping and growth progress. You can also manage photos, associate them with events, and share information with doctors, babysitters, daycare, and family members. Baby Zoe can also be used during pregnancy to help moms keep track of all the important information about the pregnancy and growing baby. Rusten and Karen are working tirelessly to improve Baby Zoe and connect it to your doctors’ offices so that the information gathered can help improve the struggling healthcare system. Rusten and Karen need your help to improve Baby Zoe and spread the word about the great mission they are working towards. To say thank you to all those who have helped and all those who will help with this cause Baby Zoe is sponsoring this $50 Target Gift Card Giveaway so you can buy those day to day essentials or have a little extra to spoil yourself or a loved one. Try Baby Zoe Today on Google Play/Android or iTunes download! Win It: Baby Zoe is generously offering (1) $50 Target gift card to a lucky winner! I like the simplicity of Baby Zoe! I like that I can utilize it on my iPad! I just downloaded the app and I am so excited to check it out! It looks really great, and I wish it were available for download on my Kindle Fire! I like it's easy to use and keep tracks on kids records. 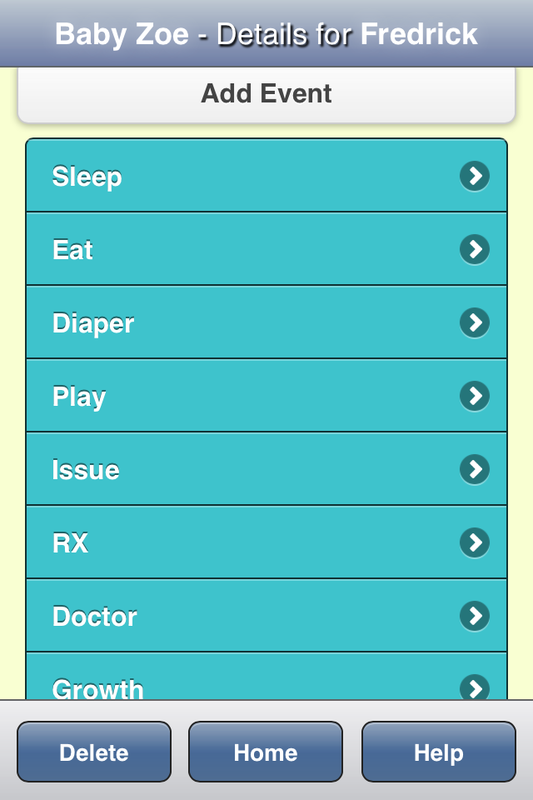 I like that you can share the info with doctors, babysitters, etc. I am going to try this out because I have an app for her sleep habits, but I typically write down her eating and bathroom habits. It's a pain to have that stuff in separate spots! I like the convenience of an all-in-one app. Thanks for sharing! Could have used this 10yrs ago! Could have used this 10yrs ago. I love that you can record growth and milestones, I don't always get around to putting those things in my daughters baby book right away and then I forget, so this would be helpful! I like that it is one place to store all that important info. I love how it makes the growth and joy of pregnancy a social experience! It's a great niche product capitalizing on the social networking idea of Facebook! We're expecting our first in 6 weeks, and this app will be perfect for my husband and I to use with our mobile devices. We've been talking about how to track things and this seems like a great answer! This will come in handy, thank you! Thank you everyone for the amazing response and feedback. Especially thank you TheresaJenkins for the constructive feedback. We are working to make Baby Zoe better but we need your help. If you haven't downloaded the app please try it out and let us know what you like, don't like, or would like to see in Baby Zoe. And don't forget to tell your friends and family about the app so we can make it amazing and sponsor more giveaways. 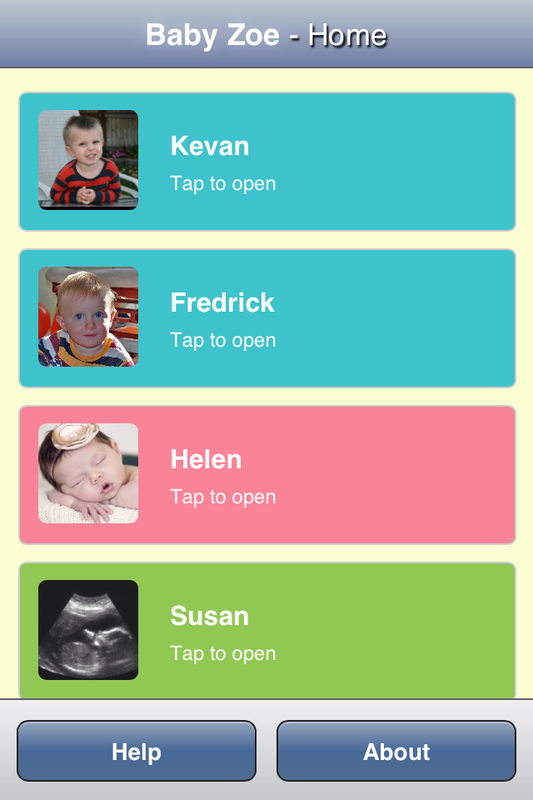 I like that you can have all your childs info at your finger tips. Tried it out and there doesn't seem to be much for those of us who are pregnant. I also found the text entry to be difficult on my phone (Droid 3) because it didn't let me go back and fix typos easily with the touchscreen. Thanks Lana! We're working to add more functionality for pregnancy as well as make the entire experience more enjoyable. It's SO NICE to have everything in one organized app! Love the simplicity! I like how easy it is to use and how everything is streamlined into one place. The logging features does make it look helpful for those with children, but it does seem a bit lacking in features for those of us who are expecting. love that it keeps track of kid's milestones. seems very useful! due with baby #1 in february! thanks! For everyone who has downloaded Baby Zoe don't forget to rate us with 5-stars on the App Store and Google Play. If you don't feel like you can rate us as a 5 yet please email me and share your thoughts about what we can do to make Baby Zoe better. I like that it's available for tablets. I like how you can Track your children's eating, sleeping, medicine intake, and growth progress. i like the aesthetic, and the concept of it! can't wait to try it out further. I like that I can keep track of immunizations of my son. I really like how easily accessible it is. I recommended this to my friend who has a son. Are you able to share the entered information with others? It'd be nice for Mom and Dad to both record and share the information from both of their phones. This sure is an awesome app though!!! I don't have any kids yet, but it looks convenient and easy to use. I like that you can use it on an iPad. I really like the organization of the site. They are helping you help yourself and your baby. The site is very well organized and is easy to navigate. I like the fact that you can keep track of health info. I like that it's easy to use. I like the layout it looks easy to use. It is easy to use and has a nice interface. It's simple to use, make perfect sense where everything is. I'd like to email updates to my family members. I love how user friendly and well-structured the app is - I'd like to see a way to add psychological and emotional issues as well, since they can go hand in hand with medical histories. I love how easy it is. Great way to keep all ur info safe and in one place!! It is very easy to use, and it is free! I love how simple it is to use. Looks great! I don't have a smart phone so I wasn't able to try it out. I'm not sure I would like it. I always worry that the service would end (they quit) or that their servers would have a glitch. If this was the only place I tracked, I'd be in trouble. If I tracked elsewhere then it's redundant. Thanks for showing it off though! Cute icons/pictures in the App!! I love that I have it with me whenever I need it. It would be so great to win the gift card! I like that I can use it on my iPod touch. I would really like to see an easier way to exit out of the app. I know that sounds a little weird, but it took me forever to easily exit the app. This is a great app no more remembering every little detail. I like the it manages emergency contacts. You can store so much on this, including what time of day you changed your baby's diaper last. I love that there is an app--making it easy to story everything in one place rather than keeping it multiple places. Thanks for the giveaway...the Baby Zoe app lets us keep all the baby info in one place with a simple interface ! 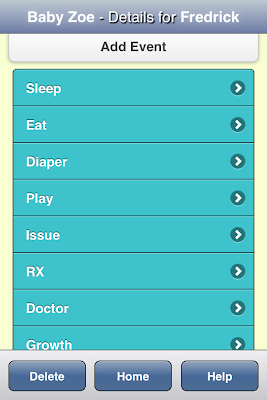 I like that it keeps track of everything and that will making doctor visits easier by having everything on hand. It looks Great! I'm going to tell my nieces about it - they have young babies! Site looks great. Easy to navigate too.